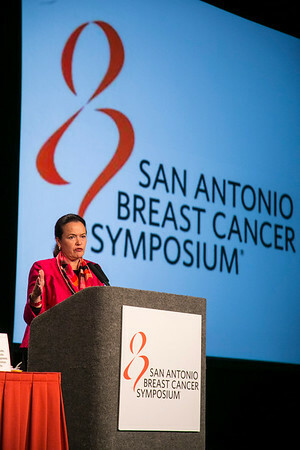 San Antonio, TX -SABCS 2013 San Antonio Breast Cancer Symposium: Piccart-Gebhart Martine addresses General Session 1 about S1-01. The association between event-free survival and pathological complete response to neoadjuvant lapatinib, trastuzumab or their combination in HER2-positive breast cancer. Survival follow-up analysis of the NeoALTTO study (BIG 1-06) session at the 2013 San Antonio Breast Cancer Symposium here today, Wednesday December 11, 2013. Over 7500 physicians, researchers, patient advocates and healthcare professionals from over 90 countries attended the meeting which features the latest research on breast cancer treatment and prevention.